Nina Riggs died in February 2017 at the age of 39. She was a poet, blogger, and mother. Her blog, Suspicious Country, was largely about her coping with cancer and the treatment for it. 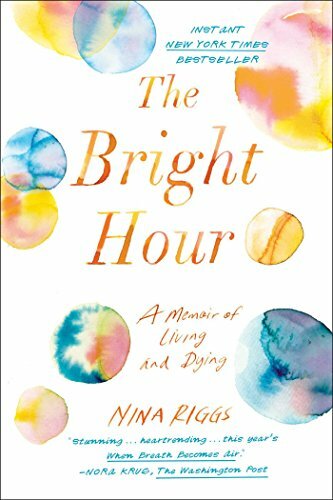 Her wonderful memoir The Bright Hour covers the same ground. She writes about her marriage to her husband John and her sons Freddy and Benny, and her parents Peter and Janet. Her mother had also died of cancer 18 months previously. So Riggs deals with plenty of disease and prospects of death, which could be hard work for the reader. But her meditations on her experience are engrossing and touching rather than depressing. She is especially interested in the life of the medieval essayist Montaigne who had plenty of loss of his own, and occasionally reflects on the work of Emerson, who happened to be her ancestor. She writes about her book club, her pets, her vacations, and smatterings of her past life before the arrival of her cancer. While ultimately heartbreaking, her memoir is beautifully written and provoking. The unabridged audiobook performed by Cassandra Campbell emphasizes the energy of the writing and Rigg's poise while facing her mortality and the loss that her family will experience. The book provides an informative chronicle of coping with modern medicine and medical insurance in the USA, but also an exemplar of how to live in a positive way while facing death.